Joe Raedle/Getty ImagesPeople hug as they attend a candlelight memorial service for the victims of the shooting at Marjory Stoneman Douglas High School that killed 17 people on February 15, 2018 in Parkland, Florida. Twitter announced it will be using “anti-spam” and “anti-abuse” tools to protect survivors of the Parkland shooting from harassment on its platform, along with verifying several of the students’ accounts. Several of the Parkland shooting survivors have become outspoken critics of the gun lobby. 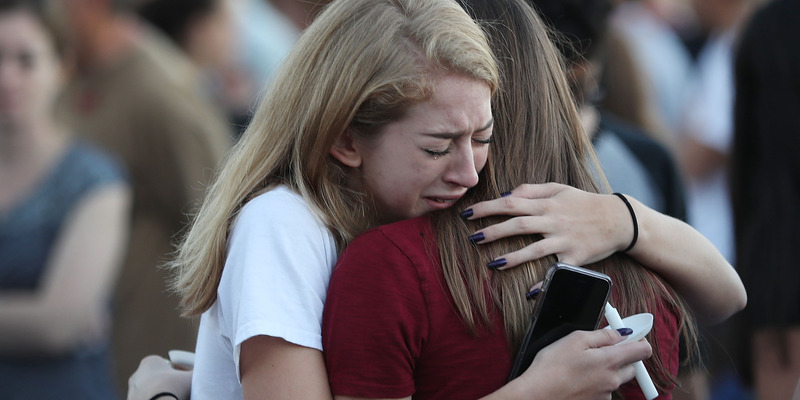 Twitter will be taking steps to protect the survivors of last week’s shooting at Marjory Stoneman Douglas High School in Parkland, Florida, after some of them were targeted for harassment across social media. “Such behaviour goes against everything we stand for at Twitter, and we are taking action on any content that violates our terms of service,” the company tweeted from an official account. Several of the survivors have come under fire from far-right groups and conspiracy theorists online, who have claimed that at least one of the survivors was a paid actor, and that the shooting itself was a staged, so-called “false flag” attack. These claims, in turn, have led to the harassment that Twitter is now trying to guard the survivors against. Twitter declined to comment beyond the content of those tweets. For their part, the survivors of the Parkland shooting, which left 17 dead and many more wounded, have entered the public debate as high-profile supporters of gun control. Meanwhile, Facebook and YouTube were criticised on Wednesday for promoting a video linked to these unsubtantiated conspiracy theories. It racked up as many as 200,000 views on YouTube before getting removed. We are actively working on reports of targeted abuse and harassment of a number of survivors of the tragic mass shooting in #Parkland. Such behavior goes against everything we stand for at Twitter, and we are taking action on any content that violates our terms of service.